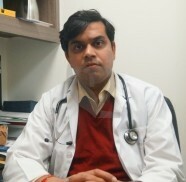 Dr. Karun Behal, M.B.B.S, M.D, D.M (Cardiology) is a consultant Inteventional Cardiologist at Alchemist Hospital, Panchkula. Prior to joining Alchemist, he was associated with INSCOL Hospital, Chandigarh as a Consultant Innterventional Cardiology & with Fortis Hospital, Mohali as Assistant Consultant Cardiology for a one and a half years. Dr. Behal has completed his basic medical studies from the Government Medical College, Patiala. Succeeded by post graduation in internal medicine from the world famed Delhi University. Thereafter, he completed his super specialization in Cardiology from the King George’s Medical University, Lucknow. Dr. Behal deals with all types of cardiac emergencies and is involved in both interventional & non- interventional cardiac procedures. He is doing both the diagnostic (CAG-Coronary Angiography) & therapeutic cardiac procedures (PTCA-Coronary Angioplasty) through Trans-Radial route. He assists all cases which include, a coronary angiogram, a percutaneous coronary intervention, an IABP insertion, balloon mitral valvotomies, Temporary and Permanent pacemaker implantation . He is proficient in the management of patients being admitted in the ICCU, ER for ischemic syndromes, heart failure, endocarditis, hypertension and perform procedures such as temporary pacing, intubation, defibrillation, invasive arterial & venous pressure monitoring. Apart from this he is an expert in the use of TMT, Holter and 2D ECHO for evaluating all cases including complex congenital cases. To his credits he has achieved a Gold Medal in Anatomy during M.B.B.S & a medal for the Best Postgraduate in Department of Medicine at Delhi University. Dr. Behal has contributed numerous research papers related to his domain in various national and international journals. Besides, the abstracts of his research papers have also been published in Abstract books.Dr. Karun Behal is an active member of various professional associations & actively participates in various workshops & conferences. Over and above he presented his publications at various conferences. A life member of Cardiology Society of India, Dr. Behal actively participates in workshops and orations held nationally to hone his knowledge and skills . l Awarded for First in Anatomy in First Prof M.B.B.S.